The University of Mindanao and Ateneo de Davao University emerged as the top performers among the accounting schools (with more than 50 examinees) in the city, with 70.59% and 65.73% passing rates respectively. This is based on the CPA Licensure Examination Results released by the Professional Regulation Commission (PRC) in October 2012. Ateneo had the biggest number of examinees (with a total of 143 – first timers and repeaters combined) in the recently concluded exam. University of Mindanao got the highest passing rate for first time takers (among schools with above 50 examinees). UIC got 88.89% passing rate – 8 out of 9 first time takers passed the exam; however, it got 0% for repeaters – no one passed among its three repeaters. Have you ever wondered which nursing school in Davao City performed better than the other in the recently concluded licensure exam? We scraped the data we used in this presentation from the Nurse Licensure Exam Results recently released by Professional Regulation Commission. We ranked them based on the number of exam takers (first timers, repeaters, and firstimers and repeaters combined); passing rates (first timers, repeaters, and first timer, repeaters combined); and, with passed minus (-) failed criterion. So, did your school make it to the top? Check the infographics below! 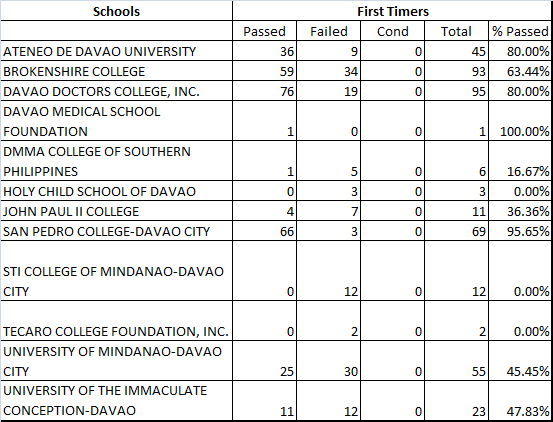 Graph 1: Nursing schools in Davao City ranked based on the number of first time exam takers. 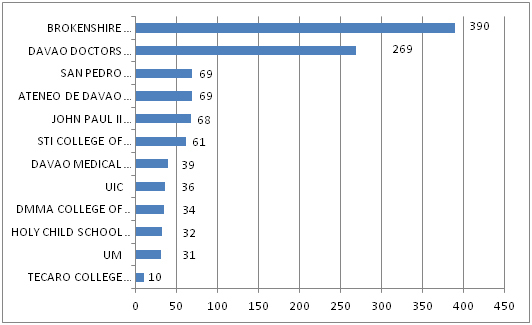 The graphical presentation above shows that Davao Doctors College tops the ranking in terms of number, with a total of 95 first time exam takers in the licensure exam held in June 2012; it is closely followed by Brokenshire College with 93. Davao Medical Foundation had only one first time taker. Graph 2: Nursing schools in Davao City ranked based on the number of exam repeaters. Brokenshire College had the most number of exam takers who wanted to give another shot in June 2012 exam, with a total of 390 repeaters; Davao Doctors College’s on the second spot with 269 repeaters. Graph 3: Davao City nursing schools ranked based on the total number of exam takers (first timers and repeaters combined). Firstimers and repeaters combined, Brokenshire College tops the list with a total of 483 examinees, followed by Davao Doctors with 364 examinees in June 2012 Nurse Licensure Exam. 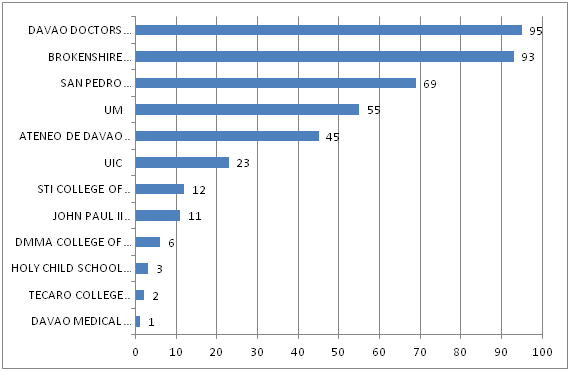 Graph 4: Nursing schools in Davao City ranked based on passing rates (first time takers data). Davao Medical School Foundation tops the ranking with 100% passing rate; San Pedro College is trailing behind with 95.65%. 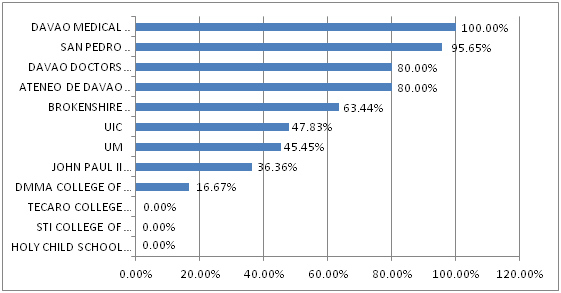 Looking back at the graph 1, you notice that DMSF had one (1) while SPC had sixty-nine (69) first time exam takers. 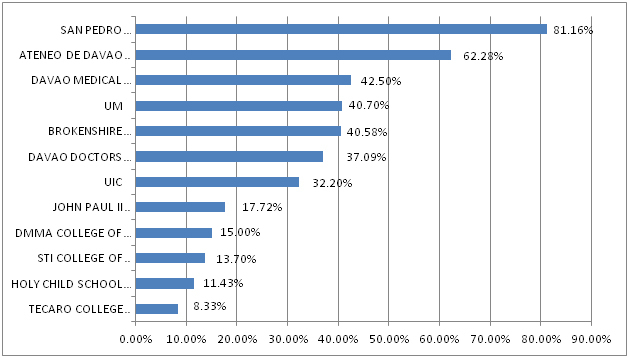 Graph 5: Davao city nursing schools ranked based on their passing rates for exam repeaters. San Pedro College had the highest passing rate – 66.67% – for exam repeaters during the nurse licensure exam held in June 2012; Ateneo de Davao made it to the second spot with 50.72%; Tecaro College got the lowest passing rate for repeaters at 10%. 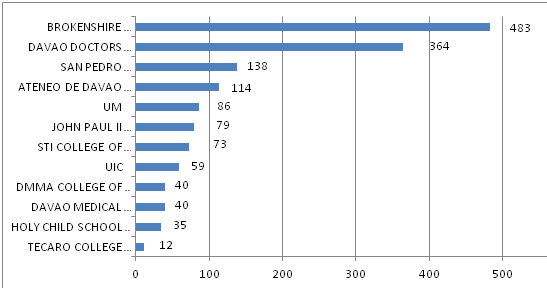 Graph 6: Davao City Nursing Schools ranked based on their overall passing rates – the number of exam takers who passed against the total number (firs timers and repeaters combined) – in the recently concluded Nurse Licensure Exam held in June 2012. San Pedro College was the highest performing nursing school in Davao city in the recent nurse licensure exam held in June 2012 with the passing rate of 81.16% – 112 out of 138 takers passed the exams. Ateneo de Davao had 62.28% passing rate, making it to the second spot in our ranking list. 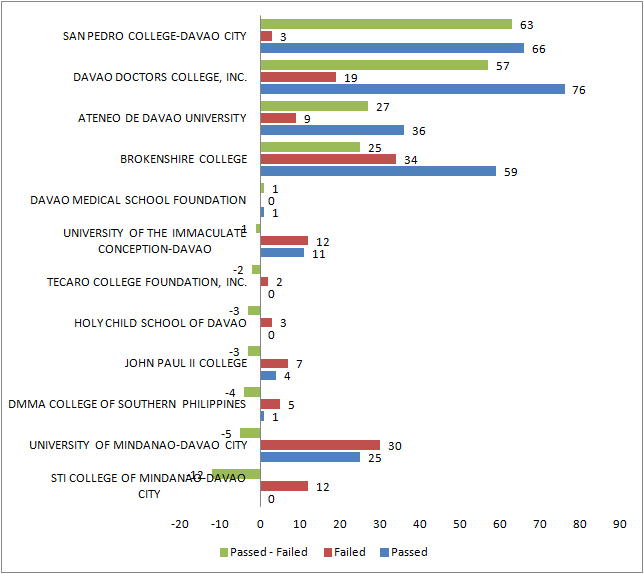 Graph 7: Nursing Schools in Davao City ranked based on passed minus (-) failed exam criterion (i.e. 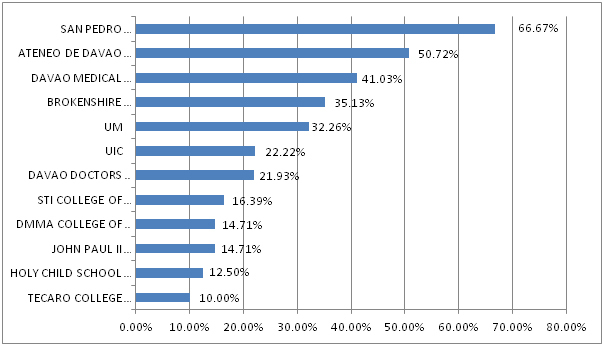 number of exam takers who passed minus those who failed) – first time exam takers data. 5 out 12 nursing schools got positive results in passed – failed data analysis; San Pedro College tops the ranking. 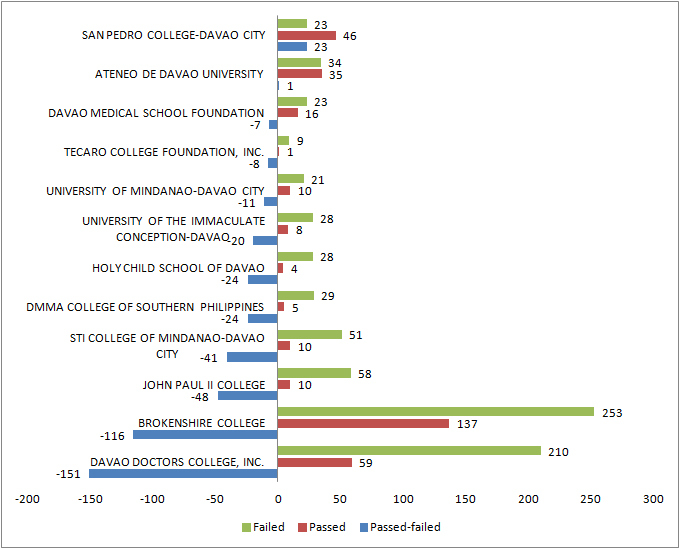 Graph 8: Nursing Schools in Davao City ranked based on passed minus (-) failed exam results – repeaters data. Graph shows only two schools gained positive results in our passed minus failed criterion (repeaters data): San Pedro College: 23; Ateneo de Davao: 1. 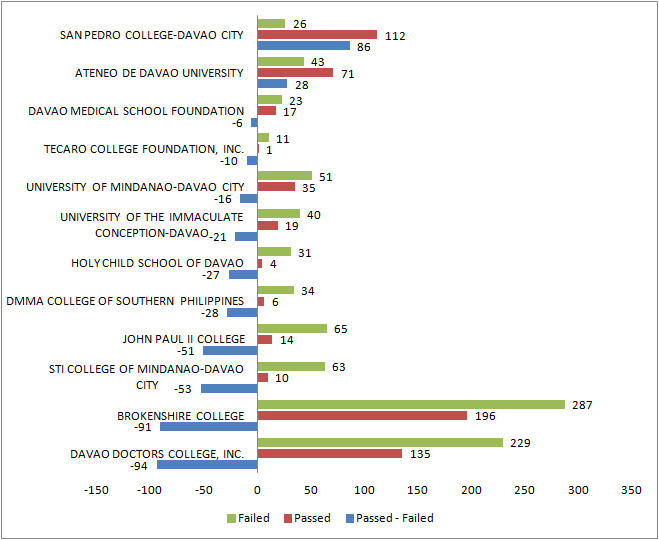 Graph 9: Nursing Schools in Davao City ranked based on passed minus (-) failed exam criterion – (first time takers and repeaters combined data). Overall, with first time takers and repeaters combined, the graph shows San Pedro College topping the list and Ateneo de Davao is not that far behind on the second spot. For comments, complaints, regarding this resource, reach us through the contact form provided above.